The oldest documentation that could be interpreted as depicting the use of reflexology is found in Egypt, in the tomb of the physician Ankhmahor, we find carved on one of the six walls, a scene representing a practice of reflexology. Reflexology is an ancient healing art which can induce healing by applying pressure to specific points on the feet, hands and ears which correspond to all the parts and organs in your body. Reflexology is a noninvasive relaxation treatment, which will affect every gland, organ and part of your body indirectly. Is Reflexology safe and effective? 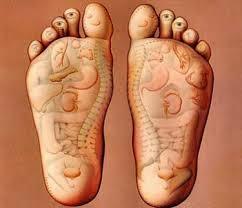 Reflexology will be helpful whether you believe in it or not and it can not harm you in any way. It will simply help your body to relax and involuntarily put one into a parasympathetic or "rest and repair" state. In this state your body will be able to do what it was intended to do and heal itself. The usual response to a reflexology treatment is either relaxation or renewed energy.